This is a regular recipe which everyone makes. This is my style of vazhaipoo porial. 3. How to clean and cut banana flower? Click HERE to view 30+ Stirfry / Poriyal Recipes. 1. Pressure cook the chopped banana flower, turmeric power and split green gram with ¼ cup of water for 2 whistle in medium flame. Allow it to cool down completely. 3. Add chana dal and fry for few seconds. 4. Add curry leaves and fry till they become crisp. 5. Add chopped green chillies and sauté for few seconds. 6. Add chopped onion and sauté till they become translucent. 7. Add cooked banana flower and dal mixture (from 1) and salt. Mix them well and cool till the water evaporates completely. 8. Finally add grated coconut; mix them gently and switch off the flame. Leave it for 2 mins in the pan itself. 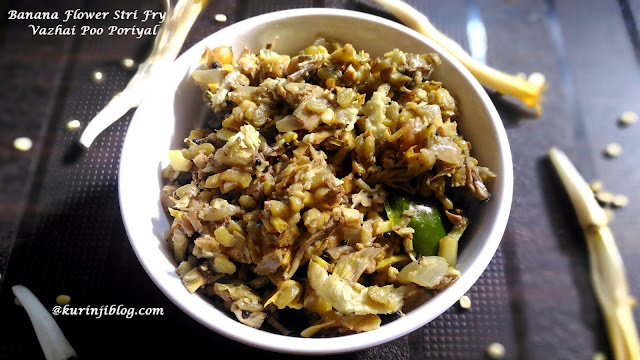 Healthy banana flower stir fry/ vazhai poo poriyal ready to serve with any type of rice recipes. 1. Addition of more onion reduces the bitterness of the banana flower. 2. Addition of coconut also reduces the bitterness. 3. Adjust the green chilli level according to your taste. 4. 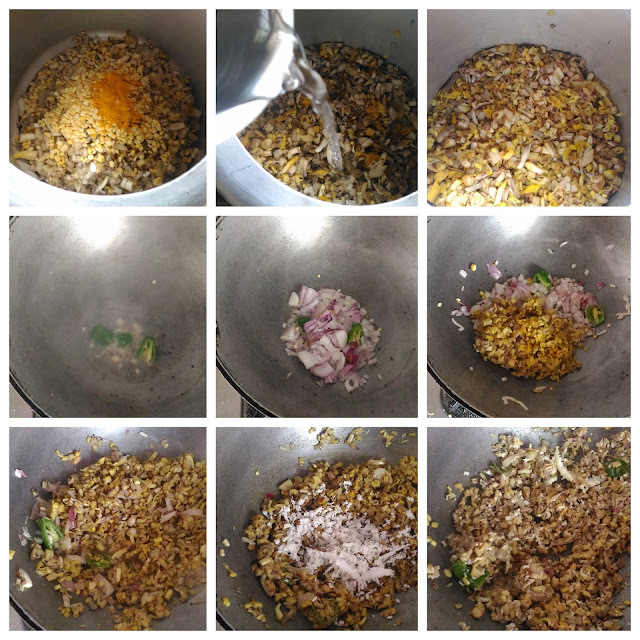 You can make stir fry without moong dal also. 5. If you clean the banana flower at once and store it, you can use it in batches whenever you want.